Toni Braxton joined her bestie Jada Pinkett Smith and Jada's mother Adrienne Banfield-Jones for the latest installment "Red Table Talk." Today's episode tackled divorce where Toni and Adrienne shared how they survived following the uncoupling of their relationships. The "Un-Break My Heart" singer divorced from Mint Condition singer Keri Lewis in 2013, 12 years after they said, "I Do." While Jada Pinkett Smith hasn't gone through a divorce herself, her husband Will Smith was going through one from his ex-wife Sheree Fletcher when they began dating. The Grammy Award winner said she "hated being divorced" and that she hated "surrendering to the lost" of the relationship. After Toni and Keri had officially called it quits, they began dating again as they tried to salvage what was left of their relationship. Toni said at the time, she didn't think her two sons (whom she shares with Keri) knew about the divorce. "My husband became my boyfriend and we were attempting to salvage the relationship again, we were hopeful," she shared. "We dated for a good year and a half, almost 2 years after we got a divorce. I know it sounds crazy, right?" The 51-year-old living legend said they tried to be sneaky and hide their issues from their children. For instance, Keri would stay until the kids went to sleep and would leave. Then, he would be back in the morning to get them ready for school. Toni then opened up about what ultimately caused them to breakup: Money! Money and the fact that she had just found out she had lupus. "I felt shallow because my ex-husband and I broke up for money issues," she explained. "I found out I had lupus at the time, I couldn't make money because I had lupus, I had to cancel the show. That was my personal contribution to the marriage failing, because who wants to take care of a person who's sick all the time?" She confirmed Keri never said that to her, but that's how she felt. "I never talked to my ex-husband about it, I probably should have, but if I'm going to be completely honest, money was just the decoration on the tree. The tree itself was I felt because I was sick, he left." She said she believes had she never got sick, they would still be together. "I always felt like if I didn't get sick and I could have continued to work, we wouldn't have had that deficit, it wouldn't have shown its face and we would probably have still been together," she added. After the divorce, Toni was ordered to pay Keri alimony and she was PISSED about that. "I was very very angry about that, but it was because we had an existing prenup and post-nup," she explained. "I wanted to renege. I'm gonna be honest. For the holidays, Toni and Keri always spend Thanksgiving and Christmas together with their kids, and she said that would cause friction in her relationships sometimes. She said it's hard blending families sometimes. 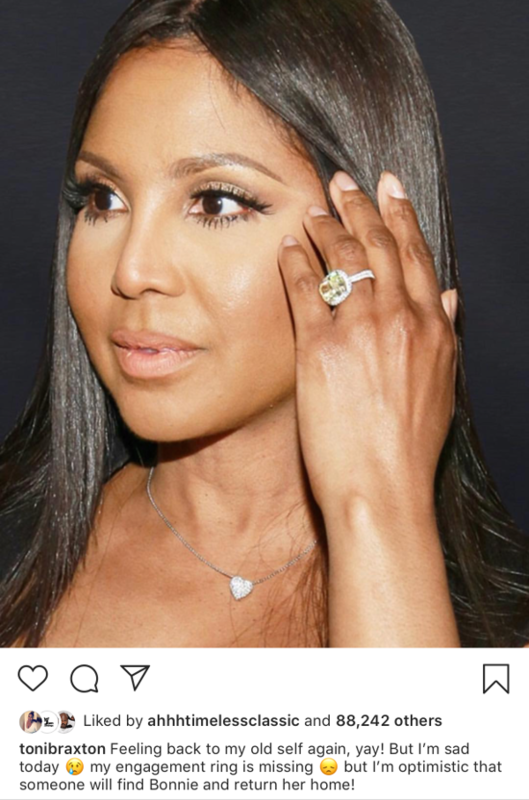 Toni Braxton has lost her engagement ring! That huge rock Birdman put on her finger is no where to be found. Feeling back to my old self again, yay! But I’m sad today my engagement ring is missing, but I’m optimistic that someone will find Bonnie and return her home!," she posted. The next day, she announced she found the bag, however all of her jewelry - including her engagement ring - is still missing. Aww! While nothing will replace the sentimental value of the ring, we know Birdman will lace her finger with a new one. By the way, Toni revealed on the "Wendy Williams Show" that Jada would be her maid of honor when she and Birdman makes it down the aisle. PREVIOUS: You GOTTA See Ciara & Russell's Kids' Excitement Waiting On Russell Post-Game + The Boshes Meet Baby Kaavia Wade + DJ Mustard & Fiancee Are Expecting!